This fabulous recipe for black bean salad was submitted by Liz Wade of Portales, NM. If you love Tex Mex recipes, this one is a particular winner. Fabulous flavors that work really well with any Mexican, Tex Mex or Cuban recipes. I think you will really like this one. Combine all ingredients and let the mixture sit for at least 2 hours before serving to meld the flavors. Overnight is even better. Add cooked green or yellow beans to the mixture for more color and even more nutrition. Liz says: If you’re feeling productive, cook a bag of black beans and use about 16 ounces for this recipe. You can use the rest in bean burritos. This is a colorful, tasty salad that is a great accompaniment to any Tex/Mex or Cuban menu. Even better, it’s super healthy! 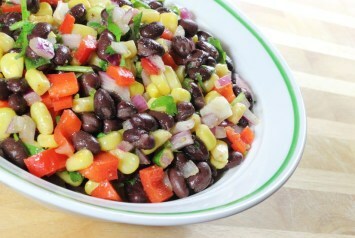 If you like this black bean salad, you will probably like our black bean salsa too. Find it here.